We developed a novel smoke oil exclusively for use with our Smoke-EL system. 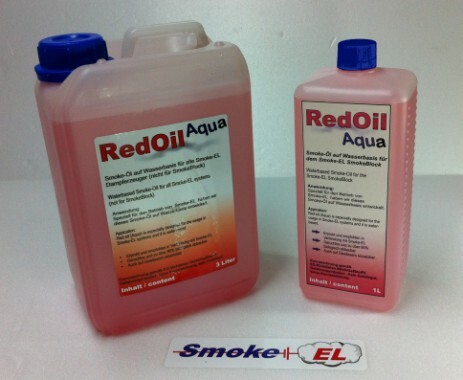 Because of its very low steam point, RedOil is better suitable to evaporate at lower temperatures than other smoke oils. Additionally, the long visible time, which all smoke oils should offer, is outstanding due to its long carbon chains. Because of these qualities it is also possible to use our oil in methanol engines. Moreover, power consumption of the SmokePump is reduced even further due to its low viscosity. If you want to use RedOil in a model with an internal combustion engine, please remember to recalculate the pumping power because of RedOil’s low viscosity (< 7mm²/sec); you will be able to starkly reduce the pump’s power output. If possible, narrow the diameter of the elbow. RedOil is a fragrance-free paraffin-oil mixture and will be delivered to you in useful 1 liter or 3 liter cans. 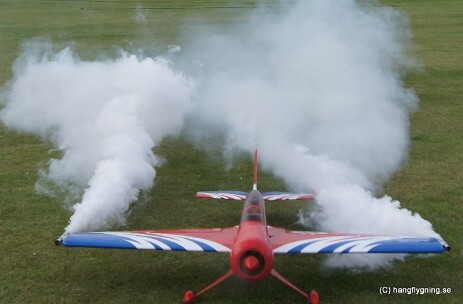 RedOil (Air) is mostly used in model planes. For use on water we developed our RedOil (Aqua). Especially developed for use with our Smoke-EL SmokeBlock this smoke oil is water-based. 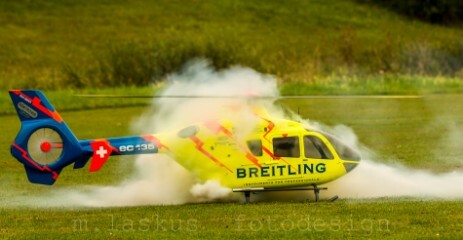 Designated according to EG guidelines 99/45/GefStoffV. We developed this novel smoke-oil exclusively for use with our Smoke-EL system. RedOil is a fragrance-free paraffin-oil mixture. Please choose a can size. This is the perfect smoke-oil for water planes. Especially designed for ecological and indoor use we developed this novel smoke oil for our Smoke-EL system. RedOil (Aqua) is a fragrance-free, water-based emmulsion.